Our Multi-Tap Lighted GFCI power cords are the perfect pigtail for all around use. Our power cords are designed around the contractor and are perfect for the hobbyist. All of our cords are heavy gauge copper conductors designed to minimize voltage drop and meet a full 15 amps or 1875 watts. These are the best cords you will find! 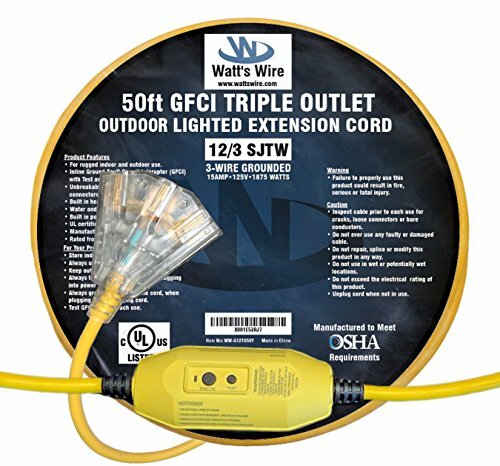 In-line GFCI, Ground Fault Circuit Interrupter, perfect to use outdoors, or near wet and damp areas.Double jacketed cable with multiple outlets rated to 125VAC 15Amp and 1875Watt.12 AWG Heavy copper conductors minimizing voltage drop and getting power where you need it.Abrasion resistant indoor/outdoor thermoplastic jacket that will stand up to concrete, but not mar your floors or walls.Built in power indicator light to assist in nighttime use or circuit troubleshooting.Designed to OSHA standards for indoor/outdoor use and certified under the UL listing.Corrosion, fire and moisture resistant, with built-in strain relief, and unbreakable NEMA 5-15 molded plugs.3 Year Warranty against Manufacturer Defects. We stand by our products. We offer a no questions asked 30-day money back guarantee. If you are unhappy for any reason in the first 30 days, return the item for a full refund! In addition to this, we offer a 3 Year warranty. If your GFCI or cord fails due to a manufacturing defect, return it to us for a free replacement.